... as so often it comes down to: Read the manual. But one thing after the other. I commented before that there's somewhat of a mystery short on my Roco 42614 turntable. Everything works fine, but when the bridge turns to one of the two tracks that lead to the rest of the layout, there is a brief short. At the time I left this to be evaluated and solved later. More than a year later, I'm working on the engine facility again, and finally took a closer look at what's going on here. 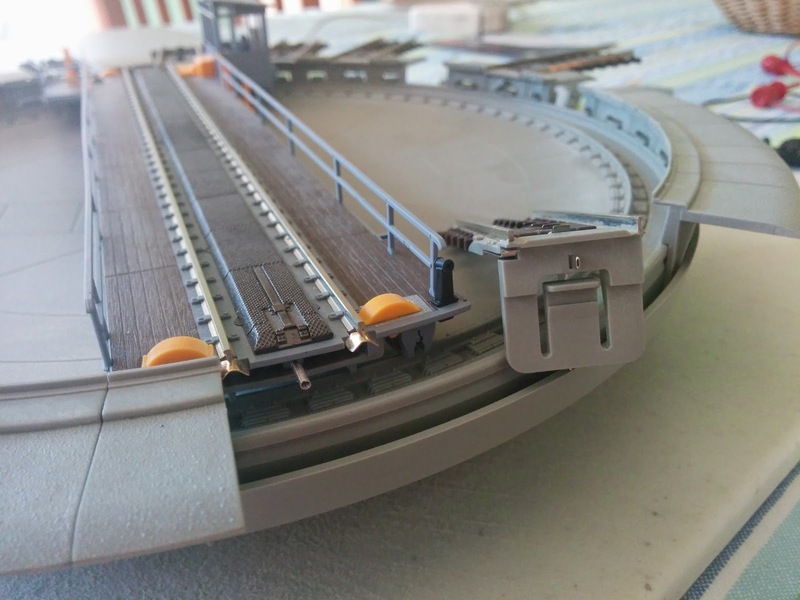 The Roco turntable is a very nice model of the standard Deutsche Bahn 20m turntable. Here we have the turntable on our dining room table. One of it's features is that it will power the house track from the bridge if so desired. This is accomplished by the two spring-loaded clips right below the rails at each end of the bridge. Normally the clips can't touch the rails due to the plastic pieces that make up the ring wall of the turntable frame. 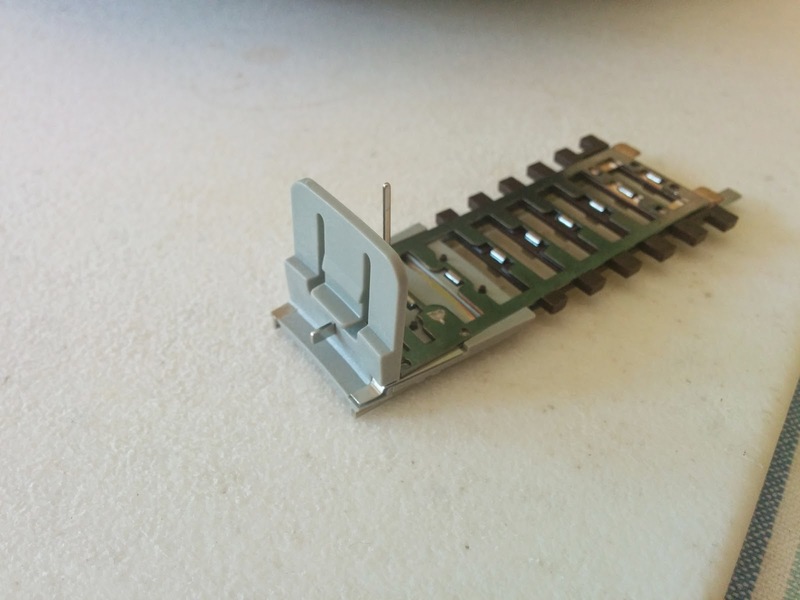 When reaching a track piece, the right hand clip will make contact with the rail, the left-hand clip makes contact with a small metal latch that, in the Maerklin version, is tied to the middle contacts. However, when the bridge turns, there is no way to prevent the left-hand clip from touching the contact for the right-hand rail and vice-versa. The solution is of course documented in the manual. 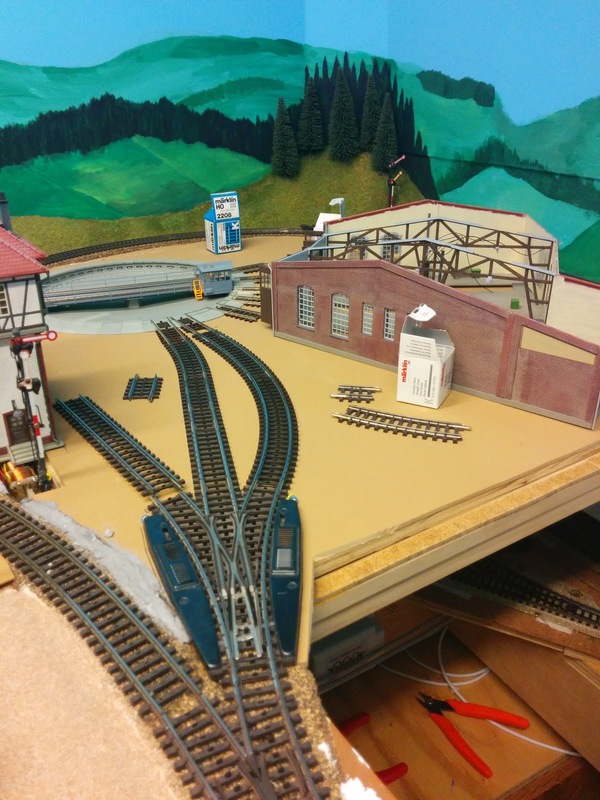 One is supposed to insulate the track pieces from the rest of the layout. In particular, the Maerklin version indicates stricter insulation of the track pieces, and power even the house tracks individually. I intended to do that anyways, since I don't need to worry about keeping power away from locomotives that are not supposed to run like in the good old analog trains days. With the turnout problem now understood, I moved on to work out the approach and coaling track layout. When I originally slapped this together, I allowed myself some leeway with the tracks, and overlooked various kinks, just to get the engine facility operational. Now that I'm actually building this for real, I wanted to fix those issues. I also wanted to make it so that the whole engine facility segment can be dropped into the layout in one piece without having to move track. 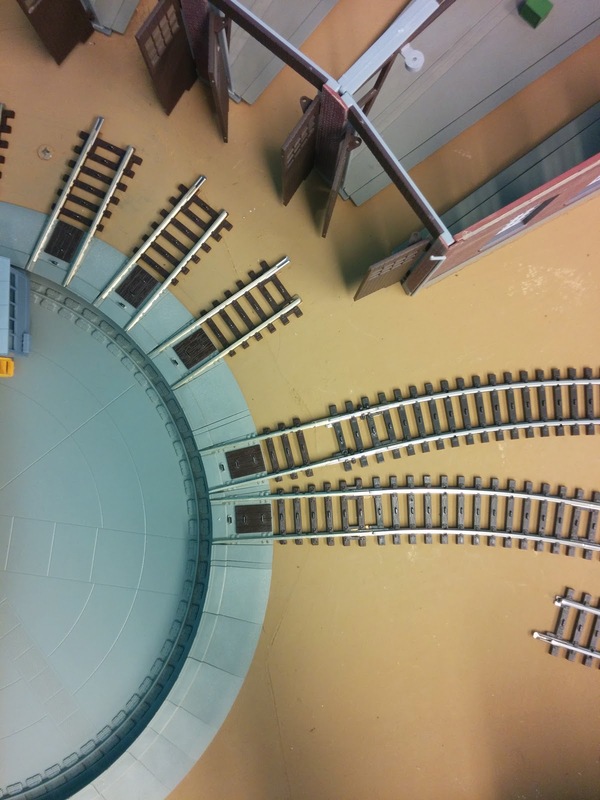 This requires a smooth transition from the three-way turnout to the adjacent turnout in Emsingen's track 1, as well as some modification of the turnout with the cut-off disk in the Dremel, so that I can drop the segment into place from above and just move two rail joiners to align the tracks. 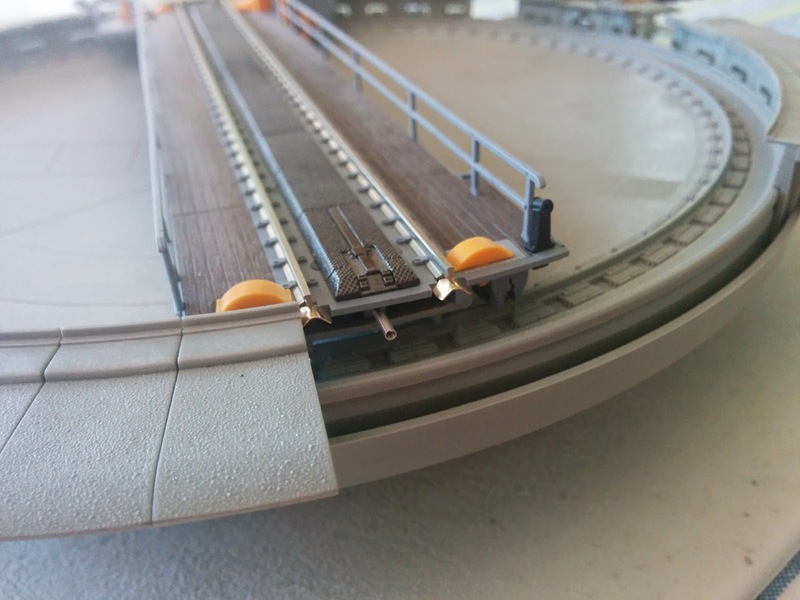 After quite some time spent arranging and re-arranging track pieces, I couldn't quite make the track layout work without cutting some rail. One of the turntable track pieces had to be shortened by about 9 mm, which was quickly done with some cut-off disk action. I could not use flex track here since the required bends are very tight. 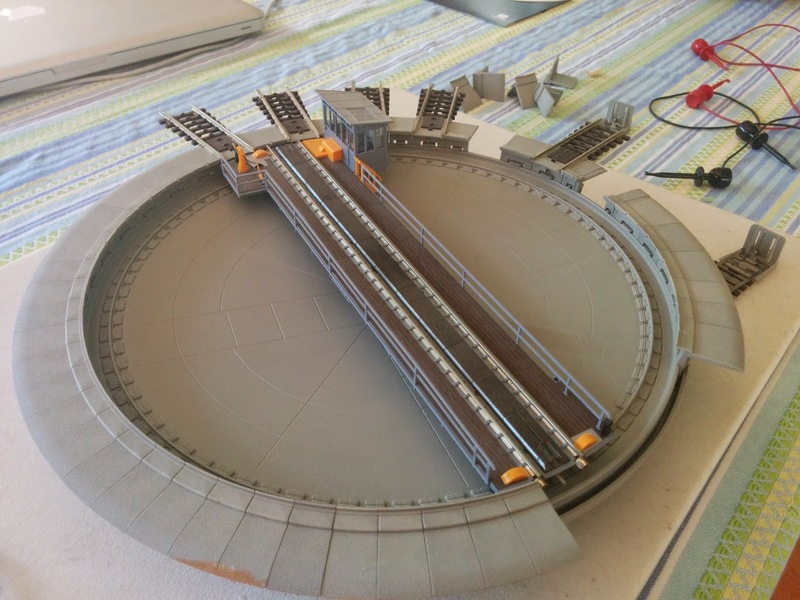 Most of the curved pieces I ended up using have a 360mm radius. Since the track is now a bit straighter than before, I'll likely forgo the storage track on the left for a shorter stub that has space for just one car to supply the coaling station, but gain a bigger coaling bunker in return.